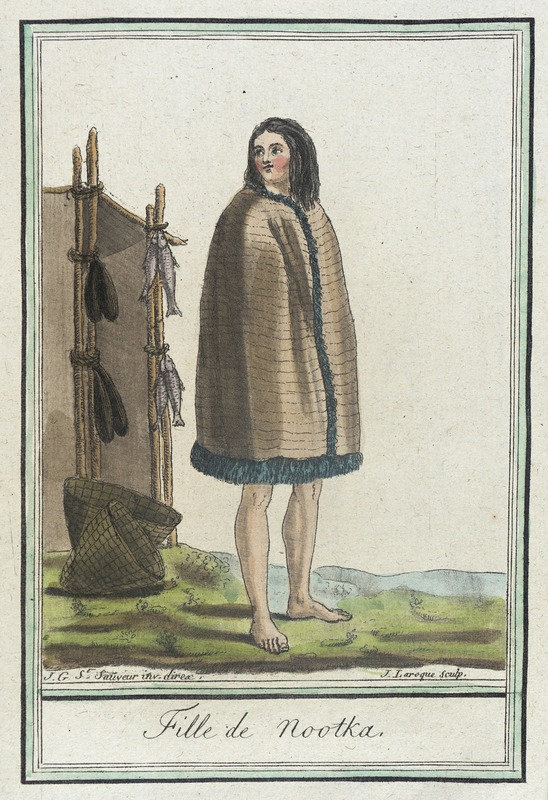 Detail of a Nootka Sound watercolour by John Webber, 1778. Click to enlarge. Source: British Museum. Nootka Sound, on the Pacific coast of Vancouver Island in Canada, was discovered by Captain Cook in his two ships, Resolution and Discovery in 1778. This drawing records this bay and some of its inhabitants. It is drawn in ink, pencil and wash and watercolours. The artist, John Webber (1751-93), accompanied Captain Cook on his third voyage of exploration in the South Seas and Pacific Ocean, which lasted for four years from 1776 to 1780. Webber was one of several artists employed to record the peoples, animals birds, fishes, plants and landscapes of the newly discovered Pacific Islands. The written descriptions of the location are confirmed by the drawing. It is severe and inhospitable. High cliffs, rocks that reach right down into the sea, and the jagged shore line gave it a ‘melancholy appearance’. The terrible weather, which left the trees ‘mutilated by rough gales’ contrasted greatly with the tropical scenes ans palm trees enjoyed by the explorers in Tahiti. Webber also drew the native people. Their clothing, basically the same for men as for women, consisted of a woven cloth, fastened at the shoulder or neck. According to Captain Cook, the cloth was the bark of the pine tree, beaten flat like a sort of rough felt. The head was covered with a conical hat made of matting. It is probable that Webber modified the drawing for the sake of decency and for public viewing. Cook described the men’s dress as generally bare in the ‘… Middles, nor are they ashamed to appear naked’. It’s not clear what the kneeling man on the right is doing: is he using a mussel shell to dig? Several harpoons complete with foreshafts seem to be visible. It is a skillful and atmospheric rendering of Nuu-chah-nulth life shortly after first contact with Europeans.